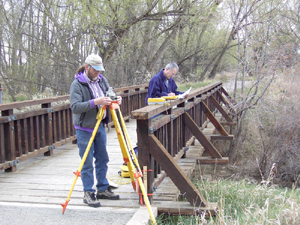 During the first week of April, fifteen scientists came to UNAVCO to participate in the inaugural "Surveying with UNAVCO equipment". The purpose of this course was to train the diverse community of scientists in the steps required to perform a survey with GPS. The three day course consisted of presentations by UNAVCO staff regarding GPS and fieldwork/office work essentials, along with a number of hours of hands on fieldwork. Because of the high level of positive feedback from the course participants, the UNAVCO field engineering group will run this course again at the facility and also at specific universities that have many scientists requiring this level of expertise in GPS Surveying.